Imagine looking in a magazine and seeing all the kitchenware, furniture, linens, specialty foods, and soaps and lotions that you have always wanted. Now, imagine having all of those items in your very own kitchen at a discounted price. Williams Sonoma is making all your dreams come true. There is no need to just dream of these things anymore. Buy a gift card to Williams Sonoma at a discount to save on the latest and greatest in kitchen cookware, gadgets and accessories. Shopping Tips: Williams Sonoma gift card is valid in-store and online. Use your card to find the kitchen implements required to whip up something wonderful today! Does Not Expire. Below is a listing of our favorite places to buy Williams Sonoma gift cards. There are always great deals and discount available when buying these so check back often. We will keep this list updated to reflect the best rates when possible. 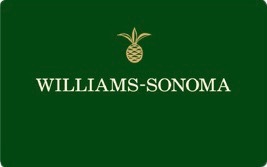 Williams-Sonoma. is an American consumer retail company that offers consumers a selection of bedroom goods, home furniture, and kitchen equipment, in addition to some specialty foods and body care products. Read more on Gift Cards Discount Rates.